While reading Matthew 7 in my devotions last week, the Lord reminded me of His desire that we be persistent in our pursuit of Him and in prayer. These verses, in particular, are what stood out to me. 7 Keep on asking and it will be given you; keep on seeking and you will find; keep on knocking [reverently] and [the door] will be opened to you.8 For everyone who keeps on asking receives; and he who keeps on seeking finds; and to him who keeps on knocking, [the door] will be opened.9 Or what man is there of you, if his son asks him for a loaf of bread, will hand him a stone?10 Or if he asks for a fish, will hand him a serpent?11 If you then, evil as you are, know how to give good and advantageous gifts to your children, how much more will your Father Who is in heaven [perfect as He is] give good and advantageous things to those who keep on asking Him! The Lord used these verses to speak two things to my heart. First of all, when we are praying according to God's will, then we should be undeterred and have relentless faith in seeking, knocking, and asking. In Luke 18:1-8, Jesus tells a parable about a widow who relentlessly and persistently kept coming to a judge for justice. This judge was unjust, and yet finally he responded to her because of her persistence. Jesus then goes on to say that God, unlike the judge in the parable, is just and He will respond to our cries to Him. The second thing God spoke to my heart about was how our God is a good Father who gives us good and advantageous gifts. 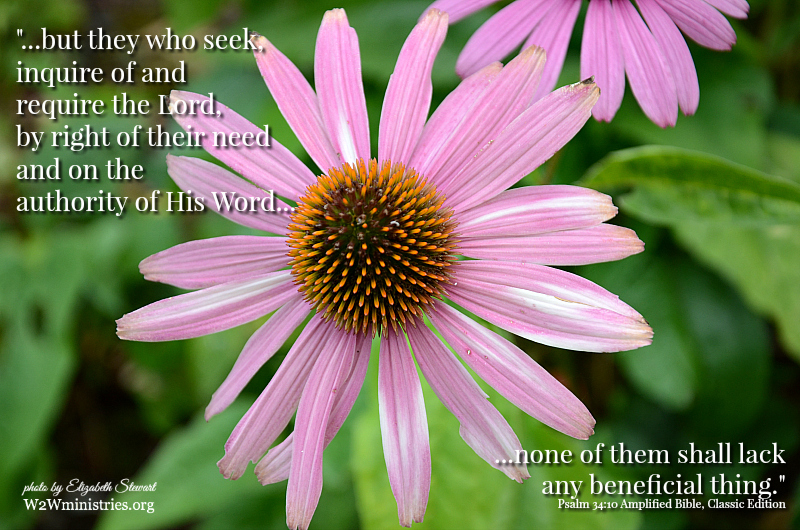 In Psalm 34:10 it says that we will not lack any beneficial thing. In other words, if God's answer to something we are asking Him for is no, then, even though we may not understand it, God Who knows all things, knows that what we are asking for is not good, advantageous or beneficial. In other words, it's not what is best for us. It may be that it's not beneficial, good and advantageous for us at this time and that He is waiting for the right time to give it to us. On the other hand, it may be that it's not best for us at all. Either way, we must be so confident in God's love for us that our faith and confidence in Him is not shattered when His answer to us is wait or no. I think that those two things, the fact that God wants us to boldly, persistently, relentlessly seek Him and pray, and the fact that He will only withhold those things from us that are not beneficial for us, should embolden us to pray with greater faith and confidence! Thank you for this lesson today from Matthew 7. We are a people who don't want to hear "no" anytime. God has the perfect plan for us and reminding us that what we ask for might not be beneficial is one we need to accept because He knows best. It is hard to accept a no when all we really want is a yes. I pray your week is blessed. Mary, what we really want is yeses from God all of the time, don't we. I can certainly act like a spoiled child demanding my own way at times, when I should be trusting that He knows best! I wrote about prayer this week, too, Elizabeth. It's so powerful. Not only because God answers, but also because of how the asking changes us. Great lesson, my friend. Have a blessed week!